The match referee raises Michael Baker’s hand in victory after a Division I consolation semifinal 15-0 technical fall win over Michael Drobnick of Cleveland St. Ignatius, March 10, at the Jerome Schottenstein Center in Columbus. Baker, a Beavercreek resident who attends La Salle High School in Cincinnati, placed sixth in the 195-pound weight class. BEAVERCREEK — He may not hail from a Greene County-area high school, but Beavercreek resident Michael Baker is more talented than most when it comes to high school wrestling. 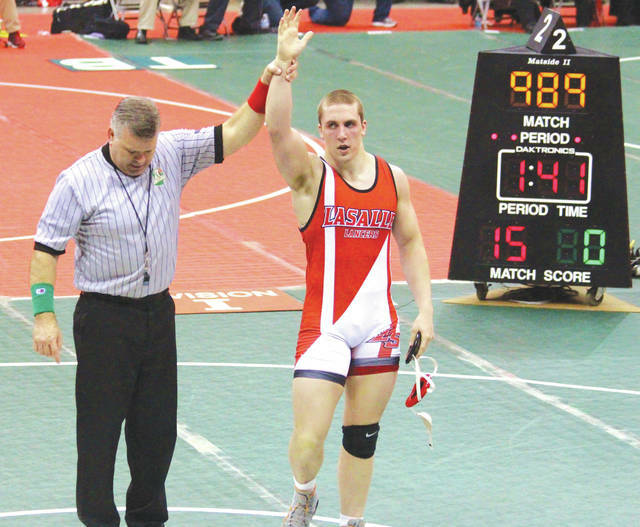 Baker, who has been making the two-hour commute to La Salle High School in Cincinnati since he was a freshman, placed sixth at the Ohio High School Division I Individual State Wrestling Tournament, held March 8-10 at the Jerome Schottenstein Center’s Value City Arena in Columbus. Wrestling in the 195-pound category, Baker qualified for the state tournament for the third time, and entered with an overall record of 40-8. He earned his spot by finishing third in the Fairmont district tournament the week prior. The junior Lancer claimed a 7-0 decision over Mount Vernon’s Ashton Spurgeon in the state tourney’s first round, but lost to eventual fourth-place finisher Ben Smith by a narrow 9-7 decision in the Championship bracket quarterfinals. In the consolation rounds, Baker advanced by default in the consolation second round over Caleb Wood of Fremont Ross. He then won by technical fall, 15-0, over Michael Drobnick of Cleveland St. Ignatius in the consolation quarters, before falling to Hillard Darby’s Jared Ball by a 10-0 major decision in the consolation semifinals. Baker was then pinned in the fifth-place match by Breylon Douglas of Austintown-Fitch to place sixth overall. According to his mom, Lisa Baker, Michael was the USA Wrestling Pre-Season National Champion in November 2017 and celebrated his 100th high school win in January at the Escape The Rock tournament in Holland, Pa.
La Salle had six wrestlers place at the state tournament and garnered fourth place among the team scoring leaders in Division I.
Baker holds a 4.3 grade-point average at La Salle. He plans college visits in April to the University of Pennsylvania and Princeton. His goal, since he was in fourth grade at Fairbrook Elementary, is to become an Orthopedic Surgeon. As wrestlers’ home towns are not listed in the state tournament’s pre-event information packet, Michael Baker was inadvertently left out of our Greene County area state wrestling tournament coverage.